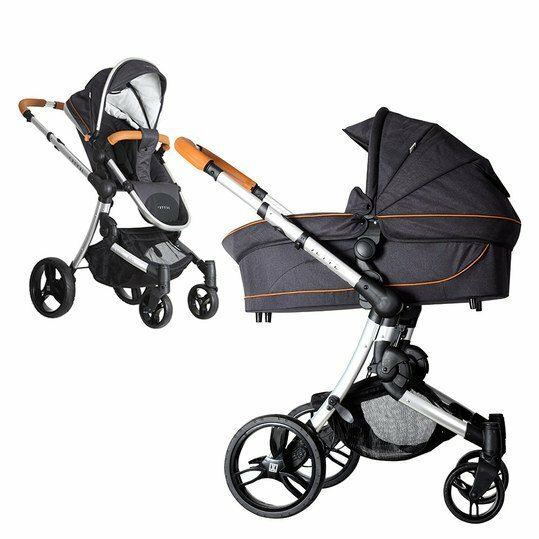 The new combi stroller Joker – Fishbone Graphite from Jette-Joop not only attracts attention on the way, but also offers you and your offspring the highest level of comfort right into infancy. It captivates by its appealing optics and by its quiet handling. Joker is equipped with technically advanced equipment: surrounded by a polyurethane jacket, they are not only puncture-proof, but also offer a ride comfort comparable to air space. In the stable, large baby bath, your child has plenty of freedom of movement and is optimally protected from the outside. 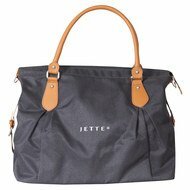 With the large hood with integrated UV protection and the protective cover, wind and weather have no chance. As soon as your child can sit on its own, you place the sports car seat unit on the lightweight aluminium frame instead of the baby bath. A padded 5-point harness and a front rail hold your child securely and gently in place. For resting and sleeping, the backrest can be adjusted in 3 steps up to the lying position and the foot rest can be adjusted 6 times. A canopy on the seat unit also protects against wind, rain and dangerous UV rays. You will always have eye contact with your little one through the viewing window. If the canopy is not used, the rear part can be removed or the canopy can be completely removed. TIP: With the optional accessories universal support, universal insert and headrest with memory foam you can further optimize the seating comfort. The Memory Foam adapts perfectly to the shape of your child's body and supports the head, neck and back of the neck. With the Joker model, walks in the city and park are pure pleasure. This is made possible by the polyurethane-covered air chambers. They are äsimilarly comfortable as air space – but at the same time additionally puncture-proof. The trolley is equipped with swivelling front wheels, which you can easily lock on uneven surfaces. You can easily move the joker around obstacles on the continuous slide bar made of contrasting coloured artificial leather. Thanks to the narrow track width, you can also easily get through narrow supermarket areas. The telescopic slide can be extended upwards in 3 steps and thus adapted to your individual size. So you are always on your way, gentle on your back. The parking brake engages securely on the rear wheels. Under the seating unit there is an easily accessible shopping basket. The Joker is also ideal for travelling. You can fold the trolley to a very compact size and transport it easily. cover and upholstery are removable and can be hand washed at 30 °C. Hallo Schl&uuml;mpfen, ja, es gibt Adapter f&uuml;r verschiedene Babyschalen, unter anderem auch von dem Hersteller Maxi Cosi. Liebe Gr&uuml;&szlig;e, Charlie von babyartikel.de. Hallo, kann man denn die Babywanne auch verstellen, sodass das Kind darin etwas erh&ouml;ht liegt? Oder ist nur der Sportaufsatz verstellbar? Hallo MummySept16, die Verstellung der Sitzposition ist leider nur am Sportwagenaufsatz m&ouml;glich. Liebe Gr&uuml;&szlig;e nach Hamburg. Hallo ShiLi88, h&auml;ufig ist das Material der Fu&szlig;s&auml;cke gegen die Witterung impregniert und daher leider &quot;so rutschig&quot; ;-) Sie k&ouml;nnen bei der Auwahl daher nur etwas auf das Material achten - eine direkte Empfehlung kann ich Ihnen leider nicht geben, insbesondere da die Qualit&auml;ten und auch die Preisspannen sehr variieren. Liebe Gr&uuml;&szlig;e nach Speyer! Wie wird dieser Wagen zusammengeklappt und ist dies einfach? Beim Modell Joie ist das eine Katastrofe!